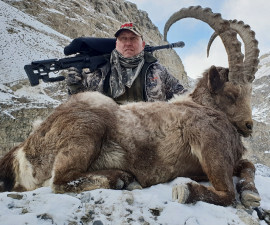 In the mid of August 2018 I hunted for Siberian Ibex in Altai mountains. 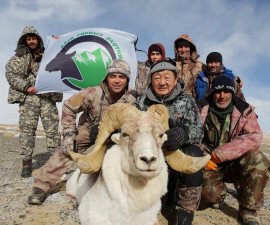 The hunt was organized not far from the boundaries of Kazakhstan, Mongolia and China. We saw just two groups of Ibexes during the week. The first one noticed us and we couldn’t get closer to shoot. After three hours of tracking down the second group we found that there were not trophy males, only females and a young goat. In twenty minutes we noticed the group of snow sheep listed in the Red Book. I accounted 26 animals feeding on the grass slope. It was a luck to meet them. Each day we met 2-3 bears and lots of Siberian stags. Mountain partridges scattered in all directions when we went by the mountain ridges. I was surprised by finding swamps on the heights 2300-2900m under the sea level. We saw brown caps boletus as well.Coming down from the ridge we set out the camp and spend the night there. Next the morning we all decided to come back to the village Belayshi to buy some food and have a rest in the hunting base. We walked about two km already when made a halt and saw snow sheep on the slope. I made the pictures trying to approach them closer by camera. I took photos against the sun and from the long distance that’s why the quality isn’t well. I couldn’t harvest the trophy which want to but I’m satisfied by this hunt and get lots of positive emotions. I’ve got nice trophy of Tatra Chamois in December 2018, Low Tatra Mountains, Slovakia. The distance was 170, Blazer K95, 300wm. 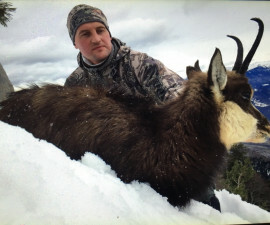 The hunt for Chamois is one of the most interesting hunts. But that time it was s hard to reach animals because of snow. It took us all daylights hours to get it and come back. But it was worth it, to go to the mountains and get the next trophy. Arrived to Gilgit town, overnight. Next day drive 3 hours by car to the base. January, temperature -12. Accommodation in a separate house with coal stove. Really cold. In the first day we arrived at the lunch time, tested guns and drove to look on the hunting area till 4 pm. 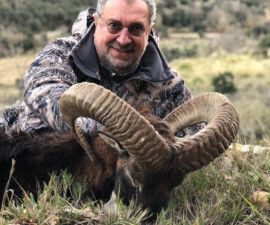 While inspecting saw few Ibexes and one trophy size.Next morning started at 7am. Examing the place, we noticed the group of 12 Ibexes: 2 young adults and 2 trophy size. 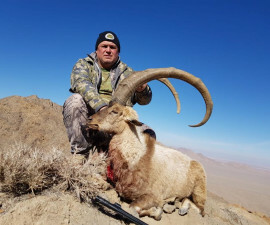 The ranges didn’t allow to shoot just because the trophy could fall from the height and the horns could be damaged. We waited about an hour while they’d change the position and came closer to us. I shot from the 400 m distance with the angle to the target of 30 degrees. Success. We left the trophy on the place. Next morning 3 rangers came to the trophy, the climb took 3 hours and 5 hours to came back. Totally the hunt was 3 days excluding the road to the base. The hunt for the both trophies took me and Alexey Kim just one day. We’ve stayed in the comfortable villa which belongs to Zulficar, landlord of that hunting area and well- known person in the country. The natives, from 7 to 10 persons per the hunter tracked down the males. There were lots of animals and the hunt was very fast. 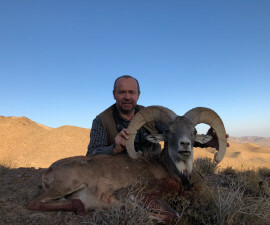 I got the Urial from 280m distance and 100m for Ibex. 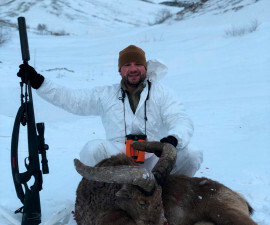 Thanks a lot for the Stalker group and its representative Alexey Alexeev for the good hunt organization. Special thanks for my son-in-law and my daughter who presented this hunt as the gift for my 70th birthday. These trophies allow me to get levels Ovis Super 20 и Capra Super 30. 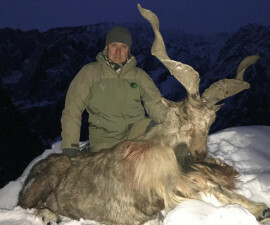 I hunted in the North Ossetia in November, 2018. I’m really satisfied by this hunt, unbelievable outlooks, hospitable people. I got the trophy from the distance 540 m at an angle of 35 degrees by one shot to the neck. Rifle 338 LapuaMagnum. Special thanks to "High Hunt Pro". 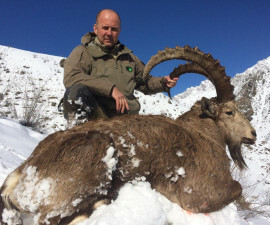 Another one hunt in Pakistan took place in Chitral, where I arrived by the helicopter on 25 January. 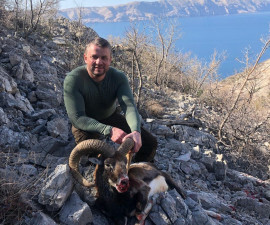 We went for the hunt at about mid-day in to the gorge near the Gahirat village. Prince Seif, the local landlord, accompanied us. 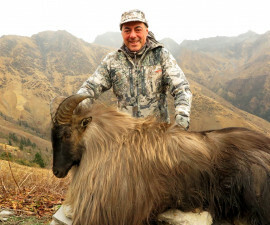 Three licenses per year for the Kashmir Markhor are given each year in this region. Local rangers started the search before we arrived and they were observing several groups of the adult Markhors for five days. A lot of snow fell in the area and the animals went to the lower heights. However, it became warmer when we arrived and the snow almost melted on the southern slopes.We noticed a single Markhor almost near the upper part of the ridge, 100 meters below its level. An elevation was ahead. I was very happy for it. Not to shoot the Markhor directly from the road! The elevation took about one hour, we reached the place, where the distance of shooting to the peak was about 400 meters. Seif gave me his rifle 300 wm caliber with Swarowski scope with regulation from 100 to 500 meters, that looked promising for the long-distance shooting. About 16:30 we saw a single Markhor. It was moving between the cliffs and it was very hard to find him. 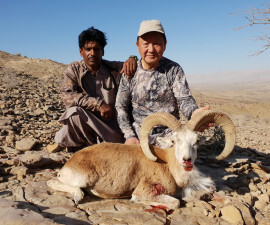 At some moment three rangers, who accompanied me started to speak actively and showed the orienteers, where the Markhor was. It was difficult to see him, it was literarily merged with rocky background. The distance was about 350 meters with the angle to the target of 45 degrees. It made me put the scope on the mark 300 meters. The first shot reached the animal directly in to the heart. Unfortunately I got 6 years old male. When saw it first time, I supposed that It’d be 8 years old male according its horns. 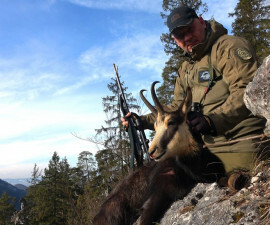 The hunt was done with the rented gun, that’s the reason why I didn’t shoot it the right place and the male run away. We found it in 3 hours, noticed the flock of scavengers which left the place very reluctantly, when we came closer. Iberian deer is the additional trophy. 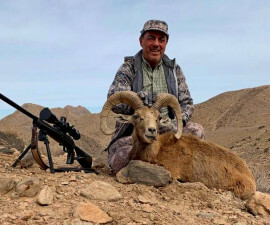 This hunt for Matison Argali took place in Murgab district of the Gorno-Badakhshan region, Tajikistan in Jan 2019. It was my 70th year birthday present from Edward Bendersky and I really appreciate it. Safar Bekmurodi organized everything on the lands of Murgab Company. My was PH Atobek Bekmurodi. The base is located on the height 4200m and has all necessary conveniences and even more to feel comfortable: hot water heating, swimming pools with hot mineral water. Temperature was -40C. Transportation is done on Toyota SUV. All guides are very professional and full of energy. 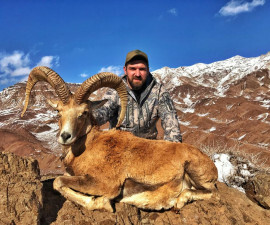 The main part of any hunt is the variety of animals and there isn’t any problem with it. Having all these components (professional staff and animals), the hunt was even easer then I expected before. Thanks to my luck I’ve got 8 years old male. 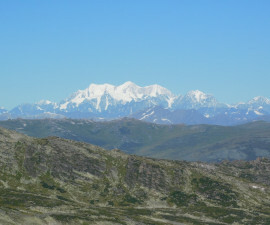 The shot was made from the approach: distance 602m, the elevation 4400m, temperature -28C, down up under the slight degree. 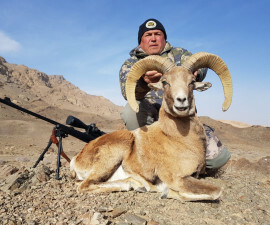 The bullet reached the male but he managed to leave with two rams through the pass. We didn’t have time to follow , it became darker. 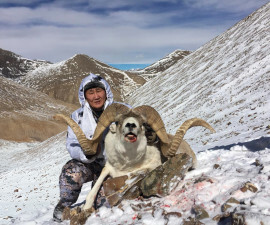 Next morning we divided in two groups and fount the ram on the bed near the pass. Atobek has took it successfully. One more time I was hunting on the lands of Davlethan Muloerov in Darvaz. 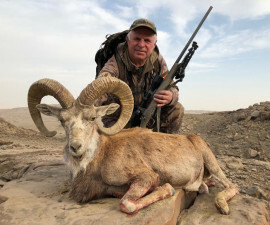 This time the object of the hunt was Mid-Asian Ibex. A lot of snow fell in the mountains before we arrived. It added a specific flavor to the hunt. I took the trophy on the second day by the first shot from the distance 500 meters.